David Klein, the real creator behind the JellyBelly Brand. Two weeks ago, I was at the Fancy Food show and wrongly presumed that Herm Rowland was the creator behind the JellyBelly brand. Though he is the current owner of this multi-billion dollar corporation, that doesn’t mean he’s the inventor. David Klein is the Cyrano De Bergerac behind JellyBelly’s ( Read Count of Monte Cristo to get the reference). Klein came up with the name, natural juice flavors and even the unique color and shape. He is and will always be Mr. JellyBelly to me. He invented this brand 30 years ago and spearheaded the gourmet jelly bean industry. If it weren’t for him, jellybeans would have a clunky, waxy, blah taste in your mouth. 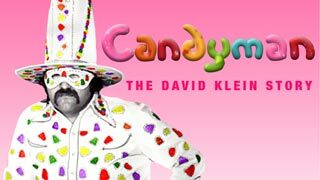 On www.Hulu.com if you type in “Candy Man: The David Klein Story” you can view his documentary for free. It’s a heart warming film about a highly educated man who threw away his parents dreams to follow his heart into the candy industry. Despite the upheavels that Klein had to face, his love for his family propelled him back into the Jelly Bean industry. David’s Signature Beyond Gourmet Jelly Beans trumps JellyBelly’s. There are no artificial ingredients and it’s only made with natural flavors and juices. Plus it’s the world’s most expensive bean. The beans are priced at $1 per ounce and if you consider purchasing a pound of it, be ready to shell out $16 bucks. David’s Signature Beyond Gourmet Jelly Beans have very distinct flavors that hit ALL the food trends including: Root beer, Ginger, habanero, thai chilli, Ginger, Coconut and Lemon. This year, over 100 new flavors will be introduced and widely tested in gourmet candy stores across the country. So far, only 20 flavors have been approved of. After I watched his documentary, I wanted to get an interview with David Klein. Lucky for me, he’s super nice and super willing to talk with me on the phone. As a whole, he’s a very easy to talk to person with a wealth of knowledge underneath his belt. In a short amount of time, I learned alot about the gourmet jelly bean industry and learned that if you want to eat something refined—be willing to pay the price. REAL gourmet jellybeans are pricey for a reason, and not easily sold at stores like Giant, Costco and Walmart. “A great product only has the best ingredients. We don’t spare expense with David’s signature line since we only want to make the best product that money can buy for,” said David Klein. Have you ever had or heard of “Astro Pops”? I did a few years ago. They are pretty tasty. Klein has helped this and several other businesses, free of charge. He knows how hard it is to get your product into the mainstream food markets and cares alot about getting people’s foot in the door via his wordly advice. If you watch his documentary then you must know how he, like the creator of “Famous Amos Cookies”, lost royalties to their brand because of aggressive business tactics by their distributors. Inspite of those hardships, David’s continual optimism helped him spearhead a new line of Jelly beans catered to more refined taste buds. I doubt you will ever see his beans at Giant, Costco or even Target. His signature line is only sold in select gourmet candy stores across the country. What’s more interesting is that www.jellybelly.com never truly gave him credit for inventing his own product, until three weeks ago. When Klein and the founder of Astro-Pops complained to the current owner about this malfeasance. If you check JellyBelly’s website, you will see a tiny snippet detailing you that David Klein invented the product. Have you ever wondered where the name for JellyBelly’s came from? David Klein told me a humerous story behind the name. He said he was watching “Sanford and Son” in the 70’s, and there was a character called “Lead Belly” on the show. For some odd reason or another that character’s name inspired the name for JellyBelly. Another interesting nugget of information I want to share is that his daughter is also a candy inventor. David Klein’s daughter Roxy invented Sandy Candy, the only sand art candy in the world that you can actually eat. I guess the apple doesn’t fall far from the tree. Lastly, If you want to eat “REAL” jelly bean, go to www.Amazon.com and search for “David’s Signature Beyond Gourmet Jelly Beans”. There you will be able to purchase haute- cuisine jelly beans and become a bon-vivant in the process. If you are a social media nutcase, like me, feel free to add David Klein on Facebook here and follow him on Twitter too. Check out his daughter’s candy line here!